With the Mi 8 Lite, Xiaomi marked the completion of the Mi 8 lineup, or so it seems. 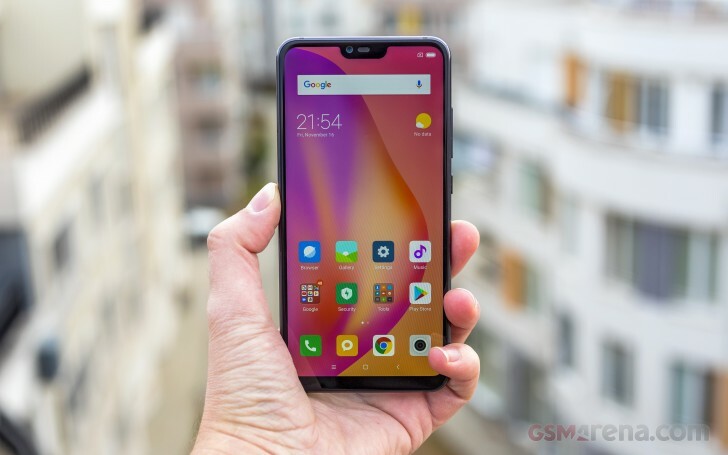 The company now has two premium flagship models in the Mi 8 family – the Mi 8 and the Mi 8 Explorer Edition along with two mid-rangers – the Mi 8 SE and the Mi 8 Lite, with the last one being the subject of this review. 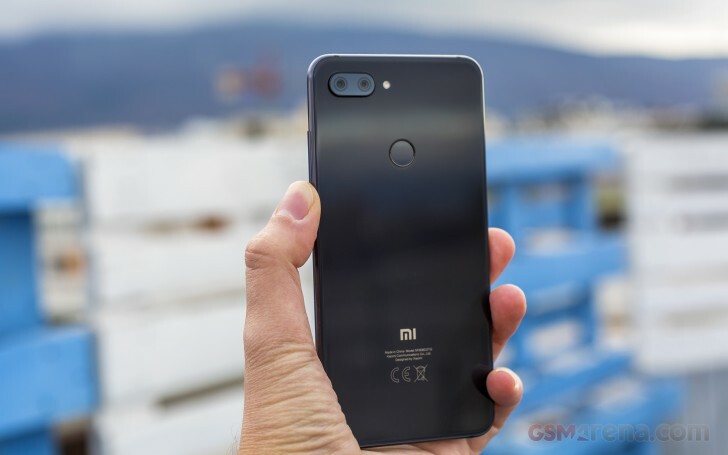 But releasing yet another Mi 8 smartphone, one could not help but think that Xiaomi is just confusing its customers and luring them into buying a Mi 8-branded handset with lackluster specs. After all, we’ve come across quite a few underwhelming Lite models in recent years. Luckily, this is not the case. Unlike most direct Lite rivals out there, the Mi 8 Lite comes at a reasonable price, while packing capable hardware and it doesn’t try to imitate its more expensive siblings, spec-wise, that is. In fact, Xiaomi could have easily released the phone under a different name or as part of a different lineup and still score good sales numbers. Body: 156.4 x 75.8 x 7.5mm, 169 grams, glass front and back panel with aluminum side frame. Screen:6.26″ IPS LCD, 1080 x 2280px resolution (19:9); ~403 ppi. Chipset: Snapdragon 660 (14nm) chipset: octa-core Kryo 260 CPU (4×2.2GHz + 4×1.8GHz); Adreno 512 GPU. Memory: 4/64GB LPDDR4X RAM, 64/128GB EMMC 5.1 built-in storage, microSD slot support (takes the second SIM slot). OS: Android 8.1 Oreo; MIUI 9.6. Rear camera: 12MP f/1.9 1/2.55″, 1.4µm dual pixel PDAF + 5MP f/2.0, 1.12µm, depth sensor, LED flash; 1080p@60fps, 2160p@30fps, 1080p/720p@120fps video recording with stereo sound. Front camera: 24MP, f/2.0; 1.8µm, 1080p@30fps video recording. Battery: 3,350mAh; QuickCharge 3.0 support (proper charger not included). Connectivity: LTE Cat.12 download/ Cat.13 upload, Wi-Fi a/b/g/n/ac, Dual-band MIMO, 2×2 antennas, Bluetooth 5.0, USB Type-C.
Of course, in order to bring the price that low, Xiaomi had to cut some corners while giving you a few reasons to opt for the Mi 8 Lite instead of Mi 8 SE. For one, the display is bigger and taller. And when you consider the smaller notch, the screen real estate should be taken into account as well. 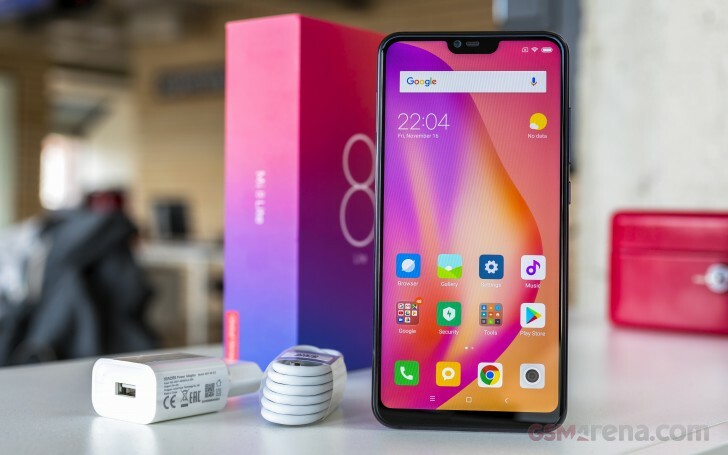 And besides, if you are aiming for a powerful mid-range SoC and you are a fan of Xiaomi’s MIUI, it’s your only option with Snapdragon 660 chipset aside from the Android One-powered Mi A2. The phone comes in a box with pretty much everything you’d expect at this price, meaning there are no headphones. But if you already own a pair of cans or buds, Xiaomi has included a USB-C to 3.5mm adapter since the phone, unfortunately, doesn’t have an audio jack. Just like the rest of the Mi 8s, this one also supports Quick Charge 3.0 but the included brick and USB-A to USB-C cable support 5V/2A charging speeds or in other words 10W. This means that you will have to look for a QC 3.0-compliant charger to get the most out of the battery. The usual user guides and sim ejection tool are at hand as well. But the best part is the transparent silicone case that perfectly wraps around the edges of the device protecting it from accidental drops. Granted, it’s a basic case, but even if you don’t like it, it’s enough to get you going while you search for another one you like better.